I am rather shocked to see that I haven’t written my blog for over two weeks. I knew it had been a while but I hadn’t realised quite how much the Winter Olympics had got the better of me. And I’m only writing this now, rather than later today so I pay full attention to the Hockey semi-final between Canada and US at noon. My husband and I already have our celebratory lunch prepared. “Celebratory” not to jinx the Canadian team but more to celebrate the impromptu holiday we have decided to take off work today. It turns out that we had some foie gras in the back of the fridge (I had no idea how this got there – must have been husband’s purchase long before Christmas) so we plan to have it with brioche (home made, presently rising), fig and walnut conserve from Chile along with a half bottle of Sauternes for lunch. I can hardly wait – and of course we’ll have it all in front of the hockey, cheering for Canada as loud as we can (sorry US readers). The main reason for not writing was that I have been very busy preparing the Chilli Pepper pattern and the preparation required for the two workshops which I held here on Sunday and Monday. 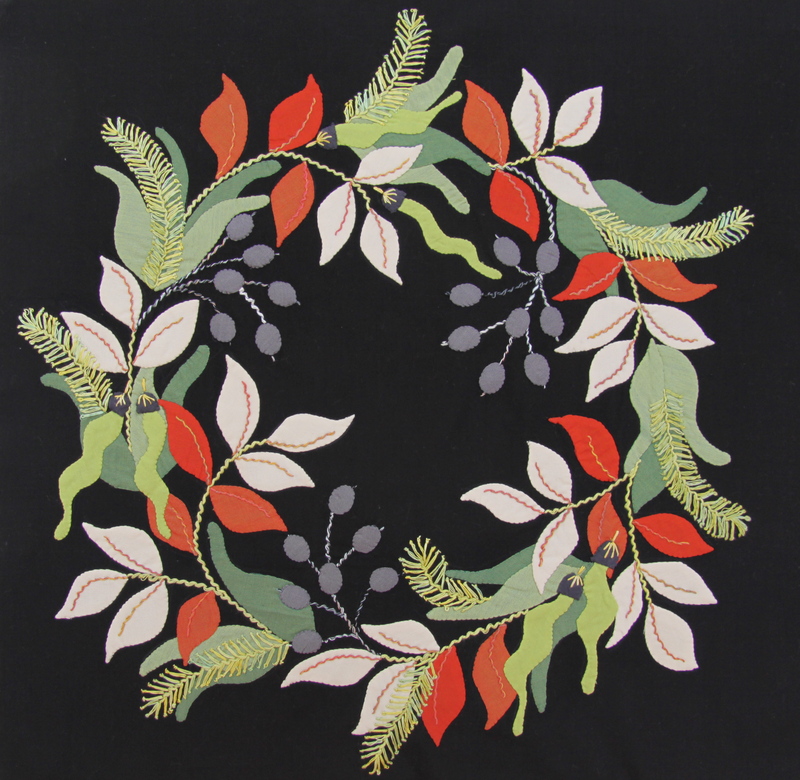 Both workshops were such fun – lots of applique, good food and good conversation. Perfect way to spend the day. During the workshops I started yet another rendition of the Chilli Pepper Wreath for a demonstration model. I decided to restrict myself to the new Oakshott shot cottons that Michael had sent me for my “library” last month. I used the new blackest black for the background and worked with greens and reds. I love the result. Here it is just completed yesterday. The acid green “rosemary” uses the lovely Sulky 4017 that is used in the BOM that some of you are doing. What a perfect colour. I would like to say a massive thank you to you all for supporting me in this venture. Thanks to all of you we raised $2195 for the Foundation Melio. I am thrilled because I exceeded the target I had set myself of $2000. Thank you everyone! I have also just completed a “Palliative Care Quilt” for the local hospice. I have not been a patchwork girl for simply years but knowing that an applique quilt would be unsuitable for the industrial style washing machines I would have to take the bull by the horns and make a patchwork quilt. It has been beautifully machine quilted by my friend and long arm quilter extraordinaire Colleen Paul. I love the colours and hope it cheers up a hospice room. 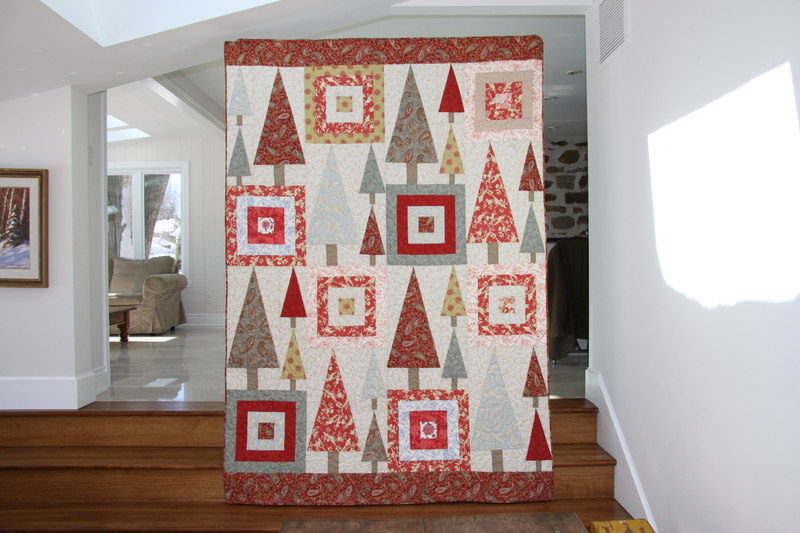 I am off to Europe in a week’s time for March break so there might be a bit of a lull before I get to the blog again so I wish you all happy quilting and GO TEAM CANADA! Two week’s ago when I decided to use the Chilli Pepper Wreath to raise some funds I hadn’t intended to take a break from my other projects to make two more cushions. 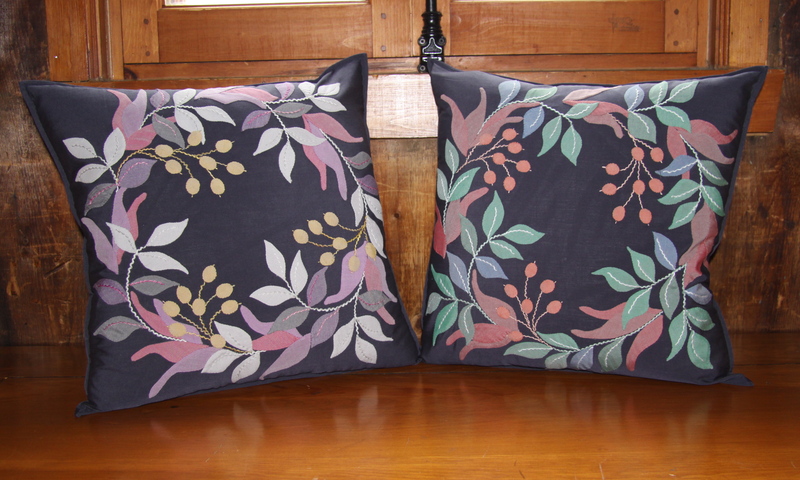 This house has so many applique cushions in it, it’s hard to find a place to put two more. Talk about coals to Newscastle. Wanting to show how the applique could be completed half way I made a version using six of the 12 colours of the Italy Oakshott collection that I showed you last week. I was so pleased with this rendition but felt that perhaps those who went on to buy a Fat Eighth of Italy to make the cushion might feel a bit cheated to have only used half of the fabrics. So this week I decided to use the other six. Of course these were my second choices from the pack so nothing could have prepared me for how lovely the second cushion looks too. And together it’s a slam dunk. I am thrilled to pieces and never realised they would look so lovely together. They are very sophisticated I feel and I have left them uncluttered by both tendrils and quilting. When I showed them to my husband I expected a brief “Well done, nice….” but he looked at them for a while and said, “The colours remind me of the Art Deco houses along Miami beach in the evening, just beautiful” so I got more than I bargained for and also he’s absolutely right, the colours are just like the art deco houses along Miami beach! Italy Collection. Just lovely.